MeetingSphere is an online workshop solution that combines anonymity with interactivity and provides a virtual workspace for teams to collaborate dynamically. The platform helps users share what they know, learn what colleagues think, develop ideas and insights, and then prioritize ideas together in a group. This tool comes with a number of features including brainstorming, rating, instant rating results, voice conference, discussion forums, automatic reporting, and screen sharing. With the brainstorming feature, users can make queries and receive opinions and input from team members. Users can either post anonymously or are tagged under a team. The rating feature allows users to find out what matters and where collaborators are agreeing on ideas. Within MeetingSphere, users can establish priorities, assess facts, and make consensuses visible. MeetingSphere delivers instant ratings results and helps the user gain visibility into top scoring items, irrelevant items, and where users are disagreeing. The discussion functionality allows participants to exchange arguments and views in depth in free text. Team members can also exchange views on multiple topics in parallel, and voice conferencing and screen sharing allow team members to provide additional material to support their ideas and opinions. MeetingSphere Unlocks the Power of People - It's truely demoCreative! I have been using MeetingSphere from the beginning and also used the predesessor SmartSpeed, so in total 7-8 years. Before this I used ThinkTank from GroupSystems which I abandoned for abvious reasons. MeetingSphere has allowed me to deliver work processes to a fraction of the time and cost compared to traditional consulting. In 2013 I was awarded "Security Consultant of the Year" by the Swedish security industry due to my efficient way of working. Today I cannot see myself to use traditional tools anymore. Sitting in a risk assessment workshop using MS Excel is so inefficient and old fashion. Extreamly costly compared to the "collaborative" way that I use thanks to MeetingSphere. For me MeetingSphere is the tool that allow me to support clients transformation of their core processes. ... I could go on for ever here ... it's a game-changer!I don't have to train any participants before they take part in sessions. The GUI is so intuitive. The other thing is the ability to participate anonymously, which then totally removes political and hierarchical influence on group contributions. I don't have to train any participants before they take part in sessions. The GUI is so intuitive. The other thing is the ability to participate anonymously, which then totally removes political and hierarchical influence on group contributions. I would like to have the administration GUI in Swedish. There are so many people in public sector who sees the benefits of this tool but they hesitate since the system texts are in either English or German. The instructions that I write for participants I write but the system-generated texts and the texts in the GUI has to be able to localize to other languages than English and German. I used MeetingSphere to crowdsource information about topics, ideation for problem solving, Innovation tools, and summary reports on a regular basis to move project teams toward their deadlines. Except for an initial kickoff that might be an on-site event, most of the work is done by dispersed employees in different time zones. We would keep the MSp work site open for asynchronous work. As a facilitator, I love not having to make sense of participants' writing an post-its and flipcharts. Their entries can be clarified and used in the report. The speedy data crunching of ranking, voting, categorizing entries into themes, and other necessary actions were such a relief to the usual laborious work I had to do in the past. I especially like having participants work asynchronously writing comments on other participants' entries - virtual dialogue. I'm a big fan!Speedy data crunching and summary reports. Speedy data crunching and summary reports. I wish a conference call feature was part of the software. Why aren't more people using this? 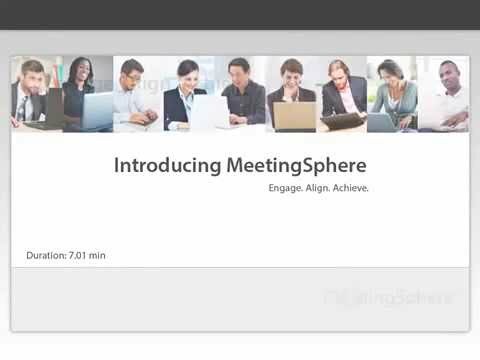 I have been using MeetingSphere for 4 years. My clients - universally - love it. It does require more planning than a typical meeting but the investment is handsomely rewarded by vastly more productive and effective meetings.Simple, easy to use, flexible for just about any situation that requires smart group collaboration. It is easy and intuitive to use. I use both the SaaS and local server versions - they provide great flexibility. Simple, easy to use, flexible for just about any situation that requires smart group collaboration. It is easy and intuitive to use. I use both the SaaS and local server versions - they provide great flexibility. The report generator captures everything but is a little clunky - I understand that this feature is being redeveloped. I'd also like automatic notification of surveys completed (similar to SurveyMonkey) but this is a very minor issue. MSp is a full-function tool for any process facilitator. It is very powerful for building and manipulating lists of data. Ideas can be easily generated, organized, categorized and prioritized. A must-have for facilitating focus groups, action-planning sessions, requirements analysis, strategic planning workshops, etc. A key feature is that all input is anonymous ... participants can enter their ideas with confidence. There is quite a learning curve to this tool. Some education / tips-and-hints are needed. Save 17% with an annual subscription. • MeetingSphere comes with automatic documentation. Ideas are included in the meeting reports, which is instantly available as a word document. • MeetingSphere aims to make discussions engaging, allows users to cover various topics, and makes better use of everybody’s time. • MeetingSphere separates voices rather than making it a mixed stream. It uses push to talk mode to improve voice quality. • Provides a dial-in feature with which participants can join video conferences using a unique PIN which is valid for only that conference. • The communication tools allow everyone to contribute simultaneously and no one needs to wait for their turn to respond or speak. Below are some frequently asked questions for MeetingSphere. Q. What type of pricing plans does MeetingSphere offer? Q. Who are the typical users of MeetingSphere? Q. What languages does MeetingSphere support? Q. Does MeetingSphere support mobile devices? Q. Does MeetingSphere offer an API? No, MeetingSphere does not have an API available. Q. What other apps does MeetingSphere integrate with? Q. What level of support does MeetingSphere offer?